In case you were wondering if the ship battles, cover-based shooting and multi-builds were enough to get you to buy another movie-based LEGO game, the free LEGO Star Wars: The Force Awakens demo has all of those things. 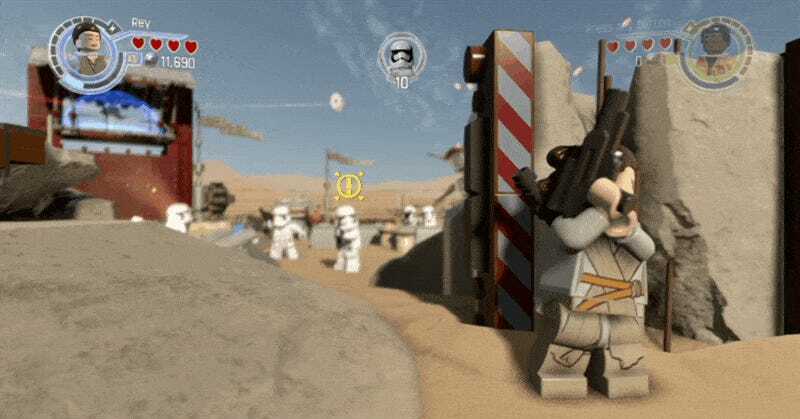 Launched last night for the PlayStation 4 and available this afternoon for the Xbox One, the LEGO Force Awakens demo follows Finn, Rey and BB-8 as they escape from First Order forces on Jakku. In order to overcome an obstacle our heroes must use the multi-build feature, which allows the same pile of bricks to become different objects. First the bricks become a switch that allows a hook-arm to swivel on axis so Finn can use his grappling hook (of course) to climb to the top of the building. Then they become a switch BB-8 can activate, revealing a surface Rey can climb. In a heated battle against Stormtroopers, Finn and Rey pop in and out of cover, charging their weapon power via successful attacks to unleash more powerful shots. The demo ends with an extended ship combat scene between some piece of junk and a gaggle of Tie Fighters. First we get an on-rails segment, followed by a bit of open arena combat that left me a bit dizzy. Then it’s just a short trip through a dead Star Destroyer, and the demo ends. It’s an entertaining 30 minutes or so that’s got me really looking forward to the full game, just a few short weeks away. I’ve trimmed the LEGO Star Wars: The Force Awakens demo down to about ten minutes in the video below. Be sure to stay for the after credits scene.